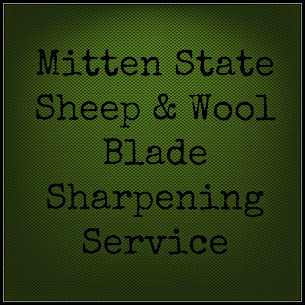 Mitten State Sheep & Wool : Spring Shearing....DONE! When you are working with the weather and animals you learn to adapt. The original plan for shearing was no longer an option. We had to shear in the other barn and unfortunately some of the really pregnant ewes couldn't get in that barn. Mike put up a ramp but they were not interested in using that. So we had to bring them into the pen where we feed them grain every day and walk drag them over to the barn. The goats always think they are invited..to everything...I don't think it ever occurs to them that they could be unwanted guest! Thankfully we had everything ready when the shearer arrived. He said he didn't mind being recorded- The tunis ewe was a little feisty being young and this being her first shearing. Most of the ewes didn't give him as much trouble as she did. It went quickly! 16 ewes and a ram later we are finished! Because of the cold weather we will leave them in the barn for a day or two to let them get use to the temperature change. So glad you got them all sheared. But what crazy weather. Us too. But no snow on the ground, thankfully. Just freezing cold. I can't wait to hear how your Tunis wool turns out. Do you do it all yourself or send it off? And will you be selling any? I would love some Tunis roving to spin. I wanted to watch the video but it says it's private. Kris, sorry the video didn't work. First time using youtube. I had it set to private..fixed the problem (I hope) thanks for letting me know! We are hoping to process it ourselves. Mike has been working on getting our small wool mill up and running. The video worked great for me, it looked awesome. You should post about the wool mill I would love to see how you guys process it. Glad that it worked for you. The wool mill is a work in process. We will do some post on it in the near future! Thank you for sharing this at the HomeAcre Hop! Look forward to seeing you again tomorrow. http://blackfoxhomestead.com/the-homeacre-hop/ What do you all do with your wool?